My areas of concentration are printmaking and painting. No matter how diverse the chosen medium or subject matter, an expressionistic use of color and image combine with a strong sense of composition to create sensual and arresting images of the city, the individual or the landscape. 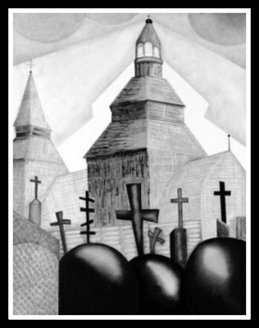 The drawings shown here chronicle a trip to explore my Eastern European and Ukrainian heritage and my visual interpretation of the Old World iconography I encountered. 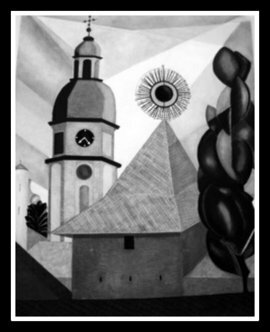 The simplicity of the compositional designs illustrates how the seemingly static solemnity of centuries-old churches, crosses and general cityscapes became powerfully present in my imagination. The spare two-dimensional perspective draws the viewer’s eye to the dynamic interplay between form, line and contrasting textures. These asymmetric compositions convey the innate spirituality of religious icons without any need to invoke their sacral, social or political backstory. 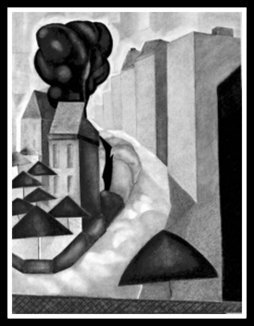 The lack of spatial illusion centers the eye on the exaggerated, almost primitive portrayal of the buildings. These drawings are executed on Stonehenge paper with charcoal, graphite and alcohol mixed with powdered charcoal. Using the soft quality of the charcoal, I was able to create textures that make the inanimate buildings look more sensual and alive. 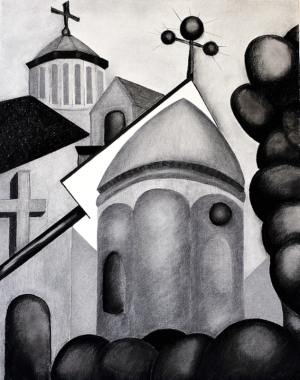 The contrast of the surrounding black and white forms gives the massive images substance. Valerie Storosh is an accomplished draughtsman, printmaker and painter. A native of Washington, DC, she developed her interest and passion in printmaking while spending time at the workshop of Lou Stovall. Her subsequent studies at Pratt Institute allowed her to gain experience as an intaglio painter in Kathy Caraccio’s studio in New York. She then continued her printmaking education overseas at Atelier 17 in Paris. Her ten years living there coupled with wide travel throughout Europe gave her a fine appreciation of European printmaking traditions. Asian traditions and techniques now also inform her work. Storosh currently lives in Los Angeles. She is a member of Women Painters West and the Los Angeles Printmaking Society. Her artwork has recently been displayed at the Pen and Brush, New York, NY; San Luis Obispo Museum of Art, CA; and the Mini-Print International Exhibition, Spain. It is also included in the collection of Bibliotheque National in Paris.